This article deals with fundamental units of LENGTH as they were brought to the New World and incorporated into everyday colonial life. This work is intended to aid researchers as they work with documents having troublesome or inconclusive descriptions of weights and measurements. Our love for metrological accuracy is quite recent; our ancestors of several centuries ago were content with far more general approximations. Consequently, with linear (one-dimensional) measurements, this lack of specificity causes much confusion for anyone trying to interpret historical records. Regionalism, as will be discussed later, complicated this situation even more. Inexactness and a general lack of scientific knowledge, pervasive in Old World Hispania, came to the New World with the early conquistadors. The lack of accuracy in colonial Mexico arose from the fact that they had no need for a universal or precise standard of measurement at that time. Spain had received and adopted its measurements over the centuries indirectly from the Egyptians, Mesopotamians, Phoenicians, Carthaginians, Greeks, and most especially, directly from the Romans. Central to all of these societies' "metrology systems" were approximations of moderate lengths taken from the human anatomy (e.g., fingers, palms, outstretched hands, forearms, etc.). Examples are found from Egypt's royal cubit, or "meh, "the length of a man's forearm (who knows which man's?) to a Greek man's head, chest, outstretched arms, and foot imprint found on a metrological relief, currently housed in the Ashmolean Museum, Oxford, England. Apparently, all early societies assumed a vague consensus on the dimensions of human appendages, or the distances either man or animal could walk or pace with ease. Outside of "moderate lengths" there were smaller sizes, such as a fine point (punto) of a pencil, width of a fisherman's line (línea), and larger ones, such as the Roman passus, or 5 Roman feet, a length adopted later as the Spanish paso geométrico, with a slightly truncated 4.57 feet. From the English came the furlong, or "furrow long," which has a near-Spanish equivalent in the estadio, whose origin was the Greek stadion.The stadion equaled 600 Greek or 606-3/4 English feet, about an eighth of a Roman mile. The furlong derived from more ancient times, as the optimal length that a cow pulling a plough could furrow one row . The largest Spanish linear measurements consisted of the mile (milla) and three times larger, the league (legua), an even 5000 multiple of the established vara. The earliest transmittal of Roman metrology to Spain probably occurred sometime between the 3rd Punic War (end of Carthage in 146 B.C.) and the rise to power of the Spanish soldier Trajan as Roman Emperor near the end of the first century A.D. Spain's local regional modifications to measurements evolved for the next fourteen centuries. Because of the extreme Spanish regionalism at the time of Mexican conquest in 1519, every Spanish province had measurement systems which only faintly resembled the "official" standard established by Castile. The regional confusions spilled over to Nueva España until the late 16th century when a royal decree established that the vara of Burgos province would henceforth be considered the "standard." In the late 19th century this vara was generally accepted as .8359 meter or 32.909 inches. With time, however, the "vara problem" became progressively worse. W. C. Wattles reports in LAND SURVEY DESCRIPTIONS that there were no less than 22 different values of the vara during Mexico's and California's Spanish and Mexican exploration periods! Much confusion still prevailed as some early metrologists tried to tease out a universal system from one inherently grounded in imprecision (fundamental lengths from body parts! ), and regional variations (political and unsettling!) contributed to the confusion, making any of a number of measurement systems possible and probable during Spain's colonization period. The chart at the end of this paper is based on the Burgos vara and shows a degree of precision compared to modern metric and English (Society of Automotive Engineers-SAE) standards. Since no academic consensus prevails as to the Burgos standard, extreme care is necessary in using the table. In many cases one unit might have been used to denote a variety of measurements. Some units changed values depending on the commodity, product, or direction being measured and some length measures changed their value over time, such as in the vara, as mentioned, and the league which changed often. Many units had specific usage for vocations such as sewing, shoe or boot making, printing, shipbuilding, agrarian and cattle industries. England's contribution to a universal measurement "solution," some two hundred years before Spain's entrada into California, added even more confusion. In 1595, under Queen Elizabeth 1, the House voted on the conventional English furlong as being 40 rods, known also as poles or perches, each unit equaling 5.5 yards. The SAE system now begins with a yard consisting of 3 feet with 12 inches to the foot. Differing Anglo-Saxon and Spanish notions about "precision" now came into conflict, adding to cultural and language differences. To this day, the two adopted systems are still out of sync. Spanish cultures now embrace the more exacting metric system, while English speakers are intransigent with base 12 dimensions. France incorporated the simpler and more exacting metric system shortly after Charles Maurice de Tallyrand, Bishop of Autun, placed before the French National Assembly a plan based on a unit of length equaling that displacement which a pendulum makes in one full swing per second. Louis XVI, in 1790, authorized a scientific investigation aimed at reforming weights and measurements at the end of the French Revolution. Spain followed France, after Napoleon had temporarily suspended the metric system for twenty-eight years, and fully adopted the metric system around 1867, then well past the California Mission Period. The following list contains twenty-three known length measurements (small to large) existing during the Spanish colonial period, together with the author's hypothesized genesis. The table presented, courtesy of Charles W. Polzer and the Arizona SMRC team, shows the relative relationship between all twenty-three lengths and their dimensions in more familiar SAE and metric equivalents. Please keep in mind that if any other definition of the vara is adopted other than the Burgos provinces, these definitions will be modified, and areas, to be discussed in Part II, will be greatly modified. punto: An extensively used word in the Spanish language in many idiomatic expressions, meaning a point or dot, the punto was the smallest of Spanish measurements. Used exclusively in sewing, shoe and boot making, and later printing, it was 1/12th of a línea (line) and a little over six-thousandths of an SAE inch. línea: Spanish for line, línea denotes a "twine's thickness," used for stitch measuring in sewing and most commonly in the fishing industry. It was 12 puntos and 1/9 of a dedo, equaling about 0.076 SAE inch. dedo: The Spanish word for finger or toe, dedo, begins the scale of measurements associated with the human form. The finger's breadth was handed down centuries earlier. The Egyptian digit (zebo) of 18.7mm and later the Roman digitus (finger) of 18.44mm was transferred to the New World as 17.4mm, using the Burgos definition of the vara (48 dedos to the vara). In SAE units, the dedo measures 0.686 of an inch. pulgada: The Spanish word for inch, the pulgada was the third most widely used linear measurement, after the vara and legua. These three were used traditionally as small, medium and long lengths throughout antiquity. A man's thumb width (quite often larger during prosperous times) denoted the inch in many cultures. From the Latin uncia, literally a twelfth, we get the words INCH and OUNCE. Starting out as 24.58mm, it arrives in the New World as 23.2mm and is exactly 1/3 of a palmo menor, equaling 0.914 SAE inch. palmo menor: This measurement came from minor palmus (small palm) or 4 Roman digits, or approximately 3 inches. It was used in Spanish colonial times as subdivisions: 1/2 of the sesma and 1/3 of the palmo mayor. It is about 2.74 SAE inches. sesma (jeme): A variation of the Spanish word sexma (for 1/6), the sesma was 1/6th of a Burgos vara, or six pulgadas at 5.48 SAE inches. palmo mayor: (curato, c.1620 DF): Derived again from the Roman concept of a " large palm," the Roman major palmus was 12 digits or three times larger than the small palm. Spain's adoption is similar, with the palmo mayor being exactly three times larger than the menor,or 8.227 SAE inches and is exactly 1/4 vara. pie: (tercio, c.1620 DF): Spanish word for foot, the pie is 2/3 the size of a codo and 1/3 larger than the palmo mayor. From the Roman pes, a foot of 295.7mm survives to become the Spanish foot at 278.6mm or 10.969 SAE inches. codo geométrico: (media, c.1620 DF): Spanish for elbow. Traditional naming for measures from anatomical appendages continues. The Roman cubitus, at around 18", now becomes Spain's codo geométrico, at 16.45 SAE inches. Theoretically, it is the distance between the elbow and the outstretched middle finger. codo real (de ribera): Used primarily in shipbuilding (lit. "along the shoreline"), the codo real is 1/3 larger than the codo geométrico and was exactly 8 palmos menores In SAE terms, approximately 1.83 feet. paso ordinario: Spanish for a man's length of step or pace and is 1/2 of a paso geométrico. The Roman gradus or half- passus most closely resembles the ordinario, measuring approximately 2.3 SAE feet. paso geométrico: Twice the length of the paso ordinario where again Roman influence predominates with the passus, or man's pace, about 5 feet, considered a "long" Roman yardstick. The Spanish paso geométrico measures slightly less than 4.6 SAE feet. braza: A length used primarily in the shipbuilding industry (meaning "marine fathom"), was actually measured differently for length and height. From Greek times the fathom (orguia), was defined as the distance between fingertip to fingertip of a man's outstretched arms. About 1.83m in antiquity, the fathom transferred to Nueva España as a shorter 1.67m or 5.485 SAE feet. toesa: A Spanish measurement that had absolutely no common multiples or divisions with any other Spanish measurement. Rather, the toesa was adopted quite independently from an Old French measurement (toise) of approximately 6.38 SAE feet. marca: As with the toesa, the miarca has no common divisors or integer combinations between the toesa or other Spanish lengths. It appears that this length was used as a height measuring stick, approximately 7.88 SAE feet, for sea and land measurements. It was apparently another French legacy. cordel: In Spanish colonial times there were three cordels with distinct integer equivalents of 10, 50 and 69 varas, each measuring in at 27.4, 137. 1, and 189 SAE feet respectively. Used primarily in the agrarian and cattle industries. milla: The Spanish equivalent MILE or 1/3 of a legua. From the Roman mille passus, or 8 stadia, which contains 1000 paces, came the mile (milliarium). Spain's bequeathal, the milla, similarly contained 1000 pasos geométrico or twice as many pasos ordinaries with many other integer multiples along the way. The milla is 1393m or 0.866 SAE mile. The Roman milliarium was used extensively in antiquity, e.g., along highways where stones were equally spaced and served to form military positions; also in highway maintenance. legua: The largest of Spanish measurements was the legua, or LEAGUE, which has many divisors and multiplying subdivisions. Exactly 3 millas, 5000 varas or 10,000 codos; it was 2.597 SAE miles or 4180 meters in length. The governments of Spain and Mexico mandated a standard measuring system numerous times during the colonization period (1513-1834), but the mandates were generally ignored. Without standards in measurements there was no consistency in commercial trades and confusion and disputes were the result. Provinces and localities in Spain, and later in Mexico, insisted on using their own standards. The primary reason for this insistence can be traced to the independence of the specialized guilds, each of which asserted its right to carry on practices peculiar to its own business. Regulations and ordinances for standardization regularly came down from Spanish authority, delivered by Counts and Viceroys, in the form of bandos (edicts or laws,) cédulas (decrees) and instrucciones (instructions); thus by 1513, the science of measurements (metrology) was born in Spain. Hernán Cortés writes the cédula that establishes the contraste (inspector of weights and measures). The cabildo (town council) of Mexico City passes four municipal regulations to ensure that weights and measures are secured and uniform for the protection of the public from fraud. The alcalde (foreman or administrator) Bernardino de Albornoz orders from Spain sealed and certified "standards." A royal cédula confirms the ordinances of 1567 and 1657. A real proyecto de comercio involves making rules for the payment of custom dues based on rates per cubic palmo, requiring clumsy conversions for weight measures. Accuracy is always in considerable doubt. The weights and measuring standard established in the 1620 ordinance is essentially retained. An official, scribed metal bar containing the Vara de Castilla is sent to the New World. Weights: the mark, from the standard mark in possession of the Council of Castile. 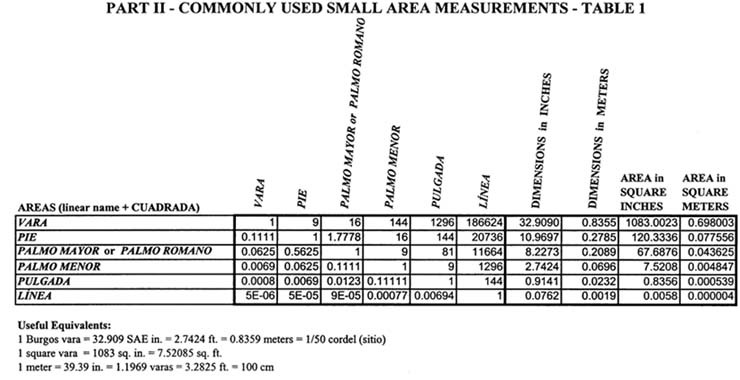 Two-dimensional or area measurements used in Nueva España evolved as noted in the earlier ordinances and included the Vara de Burgos for their determination by the time the missions began. They were used to ascertain surface sizes for moderate to small measurements (square vara and less). Larger area measures related to common lands or agrarian needs, upwards to a square league or 5,000 varas squared, were commonly called sitio de ganado mayor, or simply sitio, and hacienda, which was five times larger than the sitio. Names were given to a wide range of multiples and divisions of the vara squared and sitio. These were necessary to accommodate flourishing businesses within a pueblo and expanding farming and mining interests. Physical measurement of the sitio came about during the late Mission Period when it became important to determine the size of lots for settlers, primarily soldados de cuero who had finished out their service with the Spanish army. More formally the Mexican law of 1824 and regulations of 1828 later established the yardstick to be used and how the measurements were to be taken. The traditional account is that cord-bearers, usually two horsemen ( cordeleros) with long sticks attached by a cordel, rope or surveyor's chain made of sisal, hemp, hair, or occasionally rawhide, tied between them, made these measurements. The first horseman remained stationary with his stick planted firmly in the ground while the second galloped off along in a relatively straight line until the cordel was taut. Counting off, he then stuck his stick into the ground. Then the first horseman rode past the second rider to his 137-foot destination, thereby completing a cycle. It took many cycles to establish an edge, and at least two edges to calculate an area of measured land. The cordel (also the measure's name) used to measure the sitio for cattle grazing areas was 50 varas long. Also, 10 vara cordeles were used for measuring sheep grazing plots, the criadero, and the 69 vara cordel was used (an even divisor) for making measurements of the caballería. The length of the "established" Vara, thus, was crucial to the accuracy of other lengths and areas dependent on it. In mission times, one of the most uniform units, in relation to a standard, was in fact, the vara, because these measures were etched on staffs kept in the offices of the alcaldes, with the strict rule that they had to be affixed with unbroken official seals. However, by the turn of the century (1800), the value of the vara measurement became so varied and numerous that confusion and conflicts emerged during the next fifty years. By the end of Mexico's rule, there were over twenty-two established values of the vara alone! (Wattles 1974). Any vara (many were just under 33 inches) close to 33 inches was considered valid until 1855, when the approximate 33-1/3 inch Texas-Spanish vara became the standard for U.S. land grant patents. Small areas were simply the square of linear units, e.g., pulgada cuadrada or square inch, etc. Large areas for pueblo and farming measures were of two types: squares and rectangles (both with linear, usually vara squared or sitio units); in many cases, the name or idiomatic expression used to describe an area was based on the way the area was used. 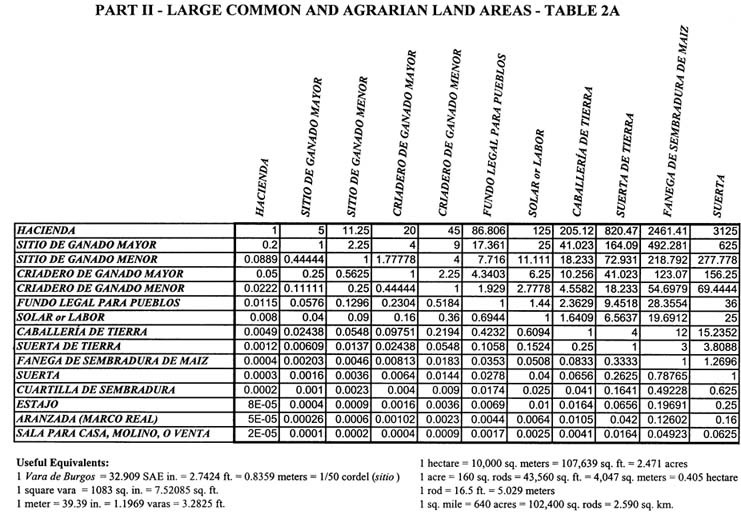 The almud and fanega were not only used for area measurements (vara cuadrada, sitio or acre), but also for capacity (medida de árido, bushel or volume) and for weights (arroba or pound), which will be described in Parts III and IV respectively. 1 square vara = 1083 sq. in. = 7.52085 sq. ft.
1 meter = 39.39 in. = 1.1969 varas = 3.2825 ft.
1 sq. mile = 640 acres = 102,400 sq. rods = 3,706,815 sq. varas = 27,878,400 sq. ft. = 2.590 sq. km. The fanega de sembradura was an area of land on which a fanega (capacity) of grain could be sown. The size of the area fanega differed according to whether corn or wheat was grown. Since weather and climate highly affect the yield of any grain, the fanega was one of the most disputed measurements. A few (and there were many) fanega measurements, used for corn and wheat during colonization and after the American conquest, appear below. sitio de ganado mayor (or simply sitio) 5,000 varas x 5,000 varas = 2.5x107 square varas = 100 cordeles (sitio) squared = 4,316.37 acres = 6.74 square miles = 1,746.81 hectares A sitio or legua cuadrada (square league) was the most common term used for area measurements for land tracts, primarily for cattle ranching. 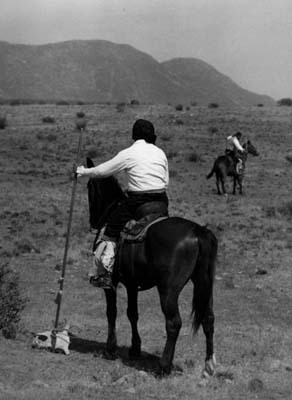 The sitio was used for making measurements for Alta California usufructuary Rancho Grants during the Mission Period and for diseños (maps) made for Mexican Rancho grant petitions after secularization. sitio de ganado menor: 3,333 1/3 varas squared = 1.1111x107 square varas = 1,918.39 acres = 776.36 hectares A sitio de ganado menor was the most common term used for area measurements for land tracts, primarily for sheep ranching. críadero de ganado mayor (1/4 sitio mayor): 2,500 vara x 2,500 varas = 6.25 x 106 square varas = 1,079.06 acres = 436.69 hectares A críadero de ganado mayor was an area measure used for nurseries, breeding plots and stock farms. críadero de ganado menor (1/4 sitio menor) 1,666 2/3 varas squared = 2.777x106 square varas = 479.59 acres = 194.09 hectares. In addition to 1:4 ratios for (críadero mayor/sitio mayor) and (críadero menor/sitio menor) there were also 1:2.25 ratios for [sitio (menor/mayor)] and [críadero (menor/mayor)]. The críaderos were simply smaller area measures for stock breeding and nursery lands. fundo legal para pueblos: 1,200 varas squared = 1.44x106 square varas = 248.62 acres = 100.62 hectares A term used for the usual size of the pueblo square, consisting of the plaza, church, arsenal, main street, courthouse, jail, townhouse, building lots and ejidos. solar or labor (1/25 sitio): 1,000 varas squared = 1.0x106 square varas = 172.65 acres = 69.87 hectares The solar (also labor) was used almost exclusively for measurements associated with farms, house, or building lots granted to new settlers, which varied in size. Both names reflect the use of this measure. suerte: 200 varas squared = 40,000 sq. 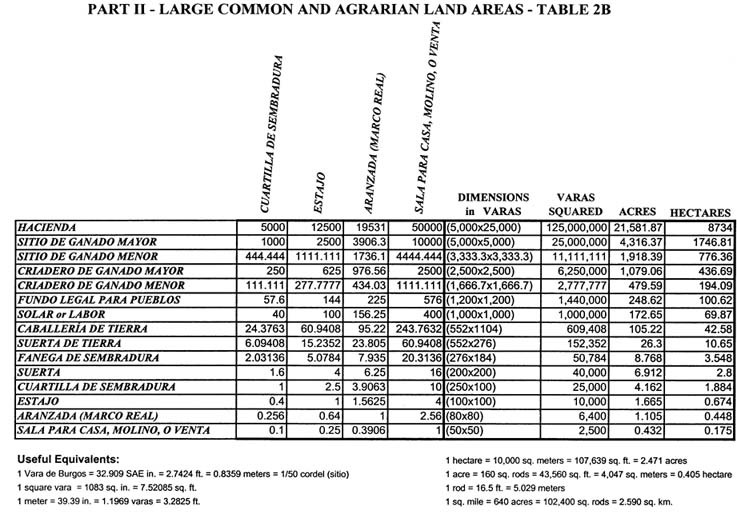 varas = 6.912 acres = 2.798 hectares The suerte was used to measure pueblo commons and small agricultural lots. Not to be confused with the suerte de tierra, about 26.3 acres, equaling a quarter caballería de tierra, used in payment to knights and noblemen after their service as conquistadores in the 16th century. aranzada (marco real): 80 varas squared = 20 estadales squared = 6,400 square varas = 1.105 acres = 0.448 hectares The aranzada was used for small surface measurements, approximating (by accident) an English acre. sala para casa, molino, o venta (1/16 suerte): 50 varas squared = 1 cordel (sitio) squared = 2500 square varas = 0.432 acres = 0.1749 hectares Literally a large room in the house, the sala was the term most often associated with measurements of a house lot in the pueblo; it was also used to establish sizes of mills and for open, unsheltered spaces, such as public lots for business. The following terms were used for the general description of farms, ranches and pueblo common areas and surrounding agricultural and livestock space. Those shown come from Hubert H. Bancroft, HISTORY OF CALIFORNIA, Vol. I, p.344, with additional pertinent references to this discussion found in Barnes, et al., 1981, Meigs, 1935 and Perez, 1996. Common pasture lands outside the ejidos. Pueblo common areas used for boarding livestock, recreation, or as land for new settlers. The size varied from pueblo to pueblo and contained approximately 16 to 20 suertes measuring up to one sitio. Ejidos were also used earlier in colonial times for the size of native villages, for common threshing land and public grazing pasture. Farm, ranch, or property estate usually associated with a wealthy land owner and his family. Town or village populated mostly by common people. N.B. For other area values, based on varas different from the Vara de Burgos, simply multiply the values shown by the square of the ratio: [New vara value/Burgos vara value]. Although obvious, care should be taken when expressing square or squared units. For example: 100 square varas are not the same as 100 varas squared. The former can be represented by a square with 10 varas to a side; the latter is an area of 10,000 square varas. There was a great deal of variation and lack of standardization for the fanega, a fundamental volume measurement, as well as for all Spanish and Mexican measurements. Miguel Stampa concluded that for all of New Spain from colonial times until the late national period that "...it is foolhardy to speak of a metrological system." Examples of variations in the vara for length and fanega de sembradura for area are found in Parts I and II of this series. Many attempts were made at establishing uniform measurements for over three centuries. (Part II, A Brief Standards History, pp. 114-16, in 2003 CMSA Proceedings.) Unfortunately, attempts by the crown and viceroys to eliminate nonconformity in the marketplace were not successful. A significant step toward unifying measures was the legal description of instruments, containers, weights and scales. It was first made in the metrology legislation of 1620. In that year, viceroy the Marqués de Gradalcázar passed a decree establishing a repository of metrological implements in Mexico City's archive. [Stampa, p. 7.] The 1620 law set forth the rules for the general circulation and use of twelve "standards," mandated appropriate seals, and required periodic inspections for their accuracy. Exact copies of these measuring standards, maintained in Mexico City, had to be made by officials who came from the outer provinces, towns and mines. These replicas were inspected and sealed for use in their jurisdictions. Two distinct offices were in charge of sealing and maintaining these "standards" and are mentioned in the 1620 ordinance. [Stampa, ibid.] Both the fiel contraste and fiel marcador are described as controlling offices that were in charge of weights, scales and marks and similar "sealers" of the vara and other measures. Areas of jurisdiction for the two were not well defined. Added much later to the 1620 assemblage of standards was another important measuring tool introduced under the viceroyship of Juan de Acuóa. This was a bronze cup with the engraving "1724-25" on its outer surface. Its capacity was exactly 2 1 / 2cuartillos and fractional "cups" were manufactured over the years for wine, a very important traded commodity. A tin cuartillo, stamped with Mexico City's emblem and "99" (most likely for the year 1799), and also maintained in Mexico City’s archive, was used exclusively for olive oil, another widely traded item. [Stampa, p. 14.] Other standards for weights and measures established by the 1620 law were continually replicated, calibrated and sealed. The 1620 law was confirmed in 1667, 1687, 1720, and in 1801, and dealt out punishment for anyone who broke seals or otherwise attempted to defraud the public. Taxes, fees and periodic inspections were imposed in the later versions of the law, but the measures themselves remained virtually the same for nearly two hundred years. In provincial California, a consistent and reliable fanega standard came about in the late Mexican period, when a decree was passed on June 25, 1844 by the Los Angeles diputación (pueblo council). A standard within its jurisdiction was established "and presumably to be enforced in all pueblos and in all parts of the province." The half or media fanega standard was firmly established in the Southwest (California), when a carefully designed container was drafted and recorded in linear dedo dimensions. Multiplied by two, it became the full fanega capacity of 1.6406 bushels or just a little over four percent larger than the 1.575 bushels mandated in the measure established in 1620. [Bowman, p. 317.] This proximateness of measurement was not always achieved in colonial times. There were many important variations to fundamental measurements from sixteenth century Spain through to the Mexican-U.S. wars in the mid-1800s, but two measurements varied greatly over these three centuries and substantially affected commerce. Second, the fanega, which measured 1.575 bushels during the Burgos vara era, became 2.576 bushels in the late Mexican Period, and shrank to the 1.6406 bushels standard agreed upon in California in 1844. There were a dozen or so fanega measures that gained prominence throughout the kingdom of Spain, the empire and republic of Mexico, and in the U.S. state of California. The variations of the fanega were primarily the result of the strength of the guilds that insisted upon maintaining their own measuring standards. Their pertinacity had a profound effect on commerce during all of colonization. Volumetric measurements in colonial times were of three types: dry, liquid and arid. The Spanish used the words dry and arid to make a distinction in non-liquid capacities. The term "arid" was used for grains (for example, maíz y trigo), the adjective indicating degrees of dryness caused by weather and climate that could be expected to affect this type of measurement. Dry volume measurements were associated with conforming materials, such as sugar, spices, flour, etc. Dimensions were based initially on (and divisors of) the fundamental linear length, the Burgos vara of 1589. This was called the "old" vara or commonly "Solomon's pace." [Stampa, p. 10.] The official Spanish measurement, a scribed metal yardstick, arrived in the New World in 1721 and in Alta California in 1803. 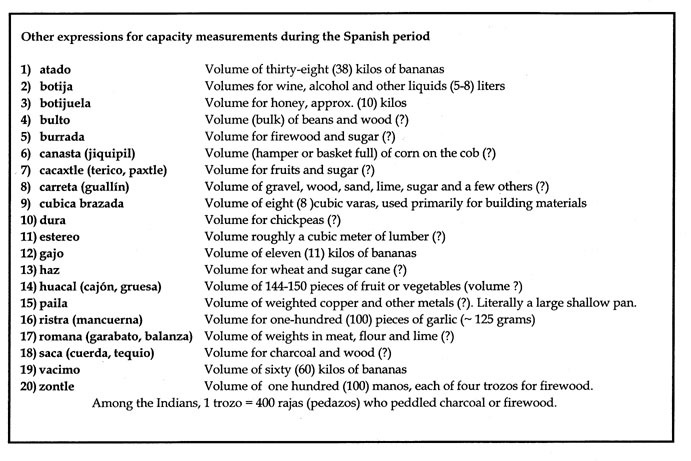 Descriptions for Spanish and English dry measure volumes were similar. Linear measures were simply cubed. For instance, the inch cubed, foot cubed, etc. had similar Spanish descriptions, though different values, in the cúbica pulgada, cúbico pie , etc. Other useful dry measurements at the time were the cúbica vara, cúbica brazada (eight cubic varas) and cúbico palmo (major). 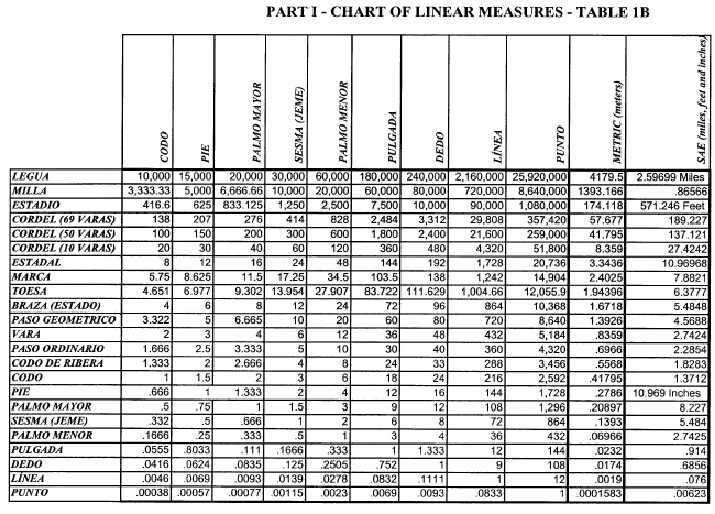 Theoretically, all the linear measurements found in Table 1A-B of Part I: Linear Measurements could be cubed but only the few presented here were found to be of practical value. Table 1A shows the most commonly used Spanish/Mexican dry measures compared to popular (but different) U.S. dry capacities. Table 1B shows useful, although not extremely large or apothecary size, U.S. dry measures. The table may be used for a quick conversion between the measures. Liquid volume capacities had at least eleven units of measurement. Two, the pipa and barril, had several different values assigned. Liquid measures had the same problems of accuracy as did weights (Part IV: Weight Measurements). The greater the value of a unit, the less accurate the measurement became. The situation peculiar to liquid measures was that the fundamental unit of measurement, the cuartillo, and its divisor, the cántara (1:32), could be assigned different values depending on whether water, wine or olive oil was being measured. 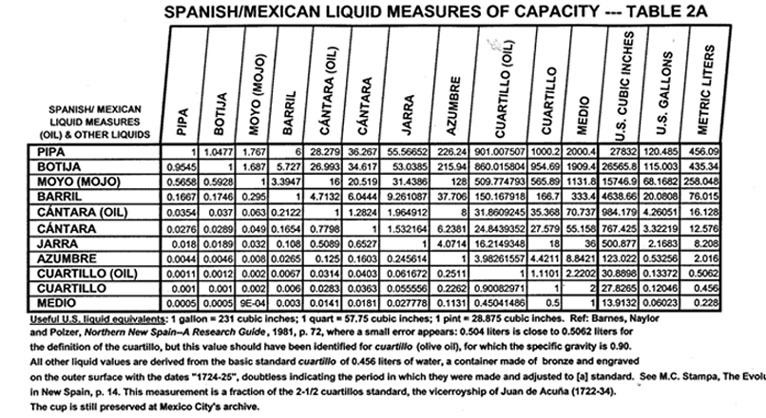 Table 2A identifies the relationship between the eleven common Spanish/Mexican liquid capacities and their equivalents in (U.S.) cubic inches and gallons, and in (metric) liters. 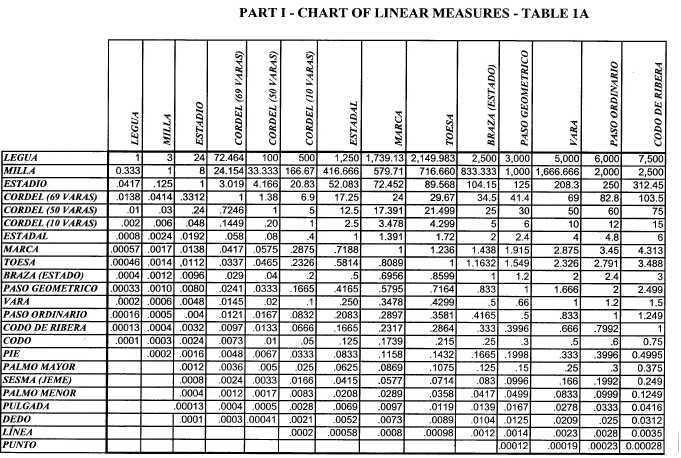 Table 2B shows useful, although not extremely large or apothecary size, U.S. liquid measures. The table may be used for a quick conversion between the measures. Arid volumes had at least seven units of measurement. Two of these, the carga and fanega , and one other by association, the almud/fanega ratio (12:1), had, some believe, the misfortune of having identical names as those used for areas (Part II) and weights (Part IV). The naming convention, however, brought about a sense of continuity by association across the measurement spectrum. Using corn as an example, we see that the fanega used as a weight, a fanega de maíz (pound), could be contained in the volume fanega de maíz (bushel), that covered an area called the fanega de sembradura de maíz (acre), when it was sown, grown and gathered,. 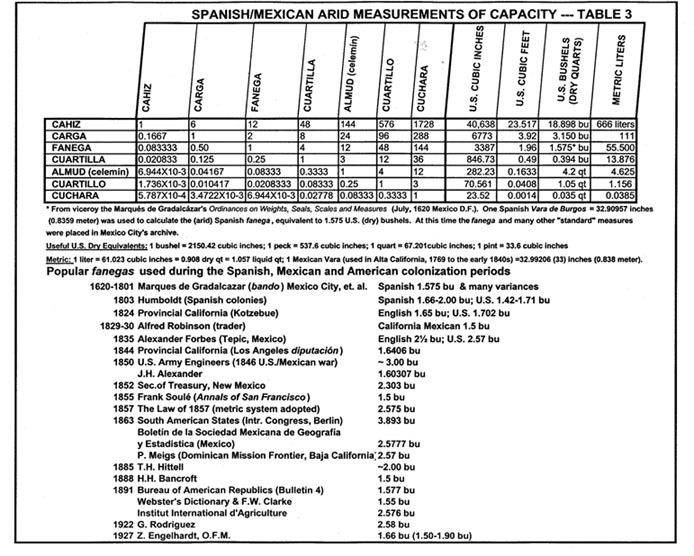 Table 3 shows the relationship between seven common and popular Spanish/Mexican arid measurements of capacity and their equivalents in U.S. cubic inches, cubic feet, and dry bushels and in liters. Also shown are a number of fanega capacity values that have been used over the centuries. Over the three centuries of Spanish and Mexican colonial expansion, numerous ordinances were attempted, through decrees and laws, to bring about unanimity in the use of weights and measurements (i.e. invoking a metrology system). To some degree it was successful in reducing the anarchy in the market place, but throughout the waning years, including especially the Mission Period, all standards were plagued by a lack of simplicity. The authorities trying to enforce these decreed standards were unable to simplify weights and measures, having various divisors and multiples that resulted in the most illogical structure. Examples included lengths (such as vara sticks) with divisions of varying thirds, unequal fourths and twelfths, fluid containers whose sizes were different depending on whether water, wine or olive oil was being bought or sold, arid measures divided into halves, thirds and fourths, and names for measurements that were adopted to mean several different types of units (weight, volume and area). The most uniformity for any Spanish/Mexican measurements came in definitions for volumes and capacities. Dry measures all had an integer multiple of the fundamental cúbica vara, though not with much logic. Liquid measures similarly had four multiples of the fundamental unit, the cuartillo (not oil), and arid measurements were all equal divisors or multiples of themselves with its basic unit the fanega. Hence, out of chaos came a glimmer of orderliness, most specifically for volumes and capacities. Barnes, T. C., Thomas N. Naylor and Charles W. Polzer. NORTHERN NEW SPAIN: A RESEARCH GUIDE. Tucson: University of Arizona Press, 1981, 68-75. Berriman, A. E.
HISTORICAL METROLOGY: A NEW ANALYSIS OF THE ARCHAEOLOGICAL AND THE HISTORICAL EVIDENCE RELATING TO WEIGHTS AND MEASUREMENTS. London: British Museum Press, 1953. MATHEMATICS AND MEASUREMENT: READING IN THE PAST, Vol. II. London: British Museum Press, 1987. THE DOMINICAN MISSION FRONTIER OF LOWER CALIFORNIA.. Berkeley: University of California Press, 1935, 165. LAND GRANTS IN ALTA CALIFORNIA.. Rancho Cordova: Landmark Enterprises, 1996. "The Evolution of Weights and Measures in New Spain." HISPANIC AMERICA HISTORICAL REVIEW 29: #1 (February 1949): 2-24. LAND SURVEY DESCRIPTIONS, 10th ed. Tustin: Wattles Publications, 1974. SPANISH AND MEXICAN LAND GRANTS IN CALIFORNIA. M.A. thesis, Berkeley: University of California at Berkeley, History 1932: 19. Printed by R&E Research Associates, San Francisco, CA 1973. Barnes, T.C., Thomas N. Naylor and Charles W. Polzer. NORTHERN NEW SPAIN: A RESEARCH GUIDE, Tucson: University of Arizona Press, 1981: 68-75. "Weights and Measures of Provincial California." CALIFORNIA HISTORICAL SOCIETY QUARTERLY, 30, 4 (December 1951): 315-338. HANDBOOK FOR TRANSLATORS OF SPANISH HISTORICAL DOCUMENTS. Austin: University of Texas, 1941: 70-87. "The Dominican Mission Frontier of Lower California," in UNIVERSITY OF CALIFORNIA PUBLICATIONS, GEOGRAPHY-Vol. VII, Berkeley: University of California Press, 1935: 165. LAND GRANTS IN ALTA CALIFORNIA, RANCHO CORDOVA. Landmark Enterprises, 1996: 237-242. "The Evolution of Weights and Measures in New Spain." HISPANIC AMERICAN HISTORICAL REVIEW, 29, 1 (February 1949): 2-24. Wattles, Gurdon (orig. William Wattles). LAND SURVEY DESCRIPTIONS, 10th ed., Tustin: Wattles Publications, 1974. N.B. Be especially careful using these references as there may be serious errors (e.g. Perez, p. 238). The cordeleros photo is one in a collection purchased by the author at a Westerners-Los Angeles Corral auction. It appears to be a still from a film on early California history, but there is no indication of the film's title, its date, the photographer, or the studio. If any reader of this article recognizes this picture and knows its origin, please contact the author by means of the CMSA email address. THE MEASURING OF ALL THINGS: THE SEVEN YEAR ODYSSEY AND HIDDEN ERROR THAT TRANSFORMED THE WORLD, New York, The Free Press-Div. of Simon & Schuster, Inc., 2002. Avina, Rose. SPANISH AND MEXICAN LAND GRANTS IN CALIFORNIA. M.A. thesis, Berkeley: University of California at Berkeley, History 1932: 19. Printed by R&E Research Associates, San Francisco, Ca., 1973. Barnes, T.C., Thomas N. Naylor and Charles W. Polzer. IN SEARCH OF A CALIFORNIA VARA STICK. Trust for Historical Preservation, July, 2001. MEASURING AMERICA: HOW AN UNTAMED WILDERNESS SHAPED THE UNITED STATES AND FULFILLED THE PROMISE OF DEMOCRACY, New York: Walker Publishing Company, 2002. "The Dominican Mission Frontier of Lower California," in University of California Publications GEOGRAPHY, Vol. VII, Berkeley: University of California Press, 1935: 135.